In the run-up to the release of the new A-Team movie there’s a new promotional game for it that has recently been released. 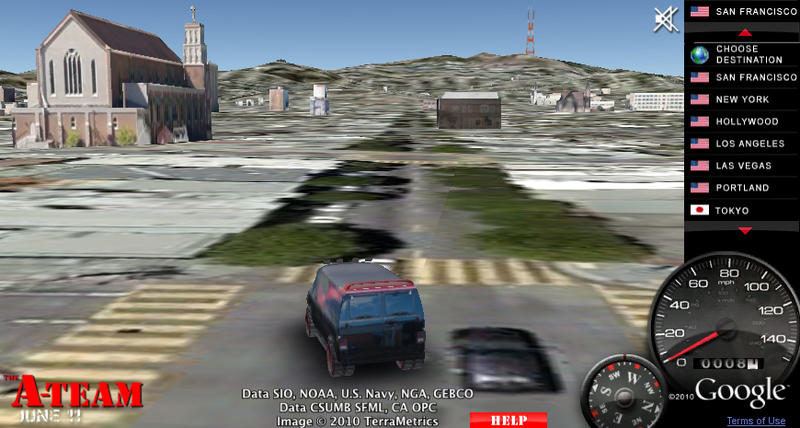 The game uses the Google Earth engine to allow you drive the A-Team van around various cities and attempt various stunts and feats. The default city for the game is San Francisco. 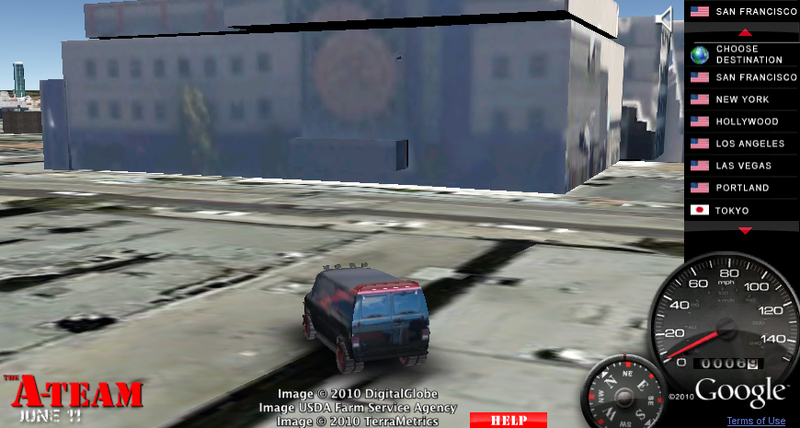 The interesting (and political) aspect of the A-Team game is being able to tour the city and see which areas of the city are rendered in better detail than others. 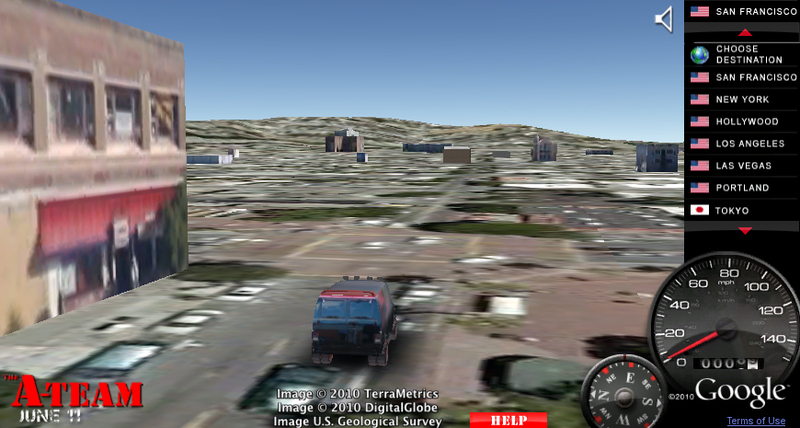 The Downtown/North Beach area that the game starts you in is very well rendered and detailed with plenty of three-dimensional objects used to represent the various buildings and landmarks of the neighborhood. As you venture further into San Francisco the experience is hit-or-miss. 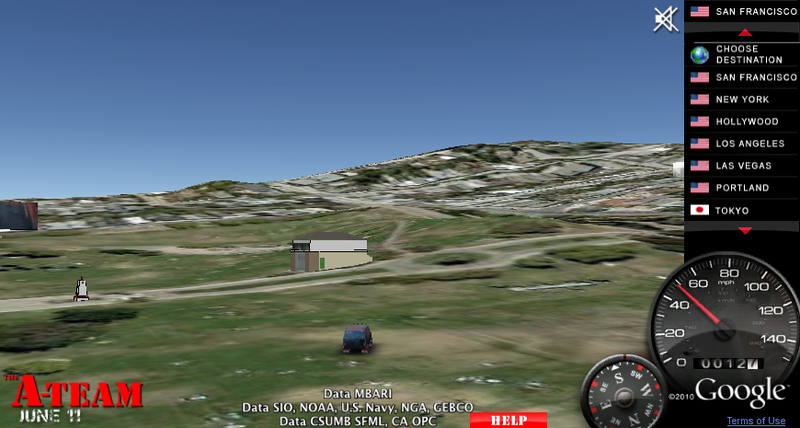 Some areas are VERY meticulous in their presentation and three-dimensional representations while others are just flat surfaces with overhead images from Google-Earth mapped onto them. My first stop in the game was my place of employment SomArts (pictured above). It’s not entirely accurate but it was a nice surprise to see it rendered in so much detail. You can see even see Rene’s black car parked out in front of the building. The A-Team is parked at the intersection of 24th and Bryant. That blotchy gathering of green trees and gray squares to the left is Galeria de la Raza. Damn, what’s up with the love? 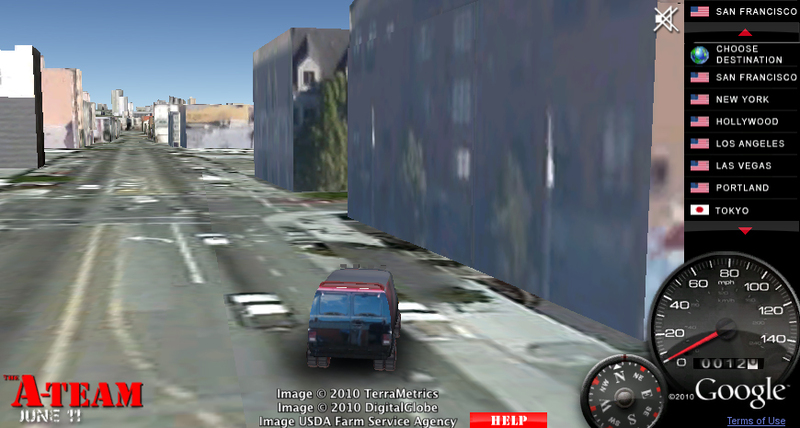 Here’s the view of 24th Street looking down the other way from 24th and Mission. For all of its iconic status 24th and Mission is barely recognizable. At least Chinese Food and Donuts gets some proper respect. Next the A-Team drove down Cesar Chavez and crashed the fences and parked in the back yard of Mariela’s childhood home on 26th street. Then they swung by my apartment on San Jose Ave. and enjoyed a view of St. Luke’s Hospital. Hannibal wanted to see a mural and this is the best one (and one of the only) the rest of the A-Team could find in the game. Driving down Mission Street the A-Team came across Foreign Cinema but not the New Mission Theater. “I pity the fool that doesn’t render the New Mission in three-dimensions!” yelled BA. 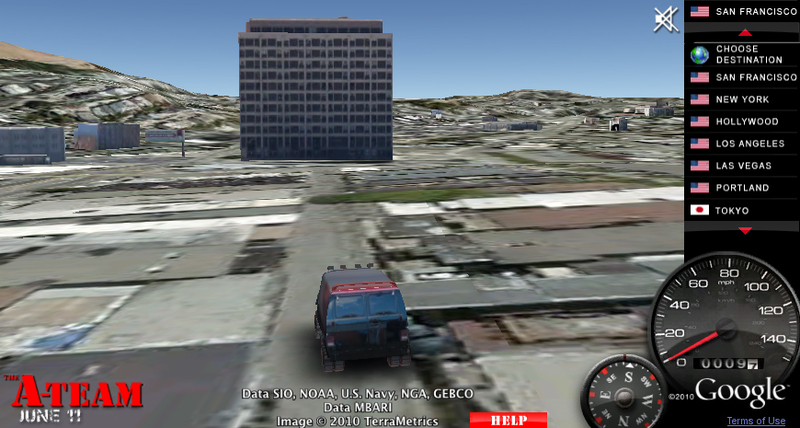 Heading over to Valencia Street the A-Team passed the CCSF Mission Campus and its giant Aztec calendar. 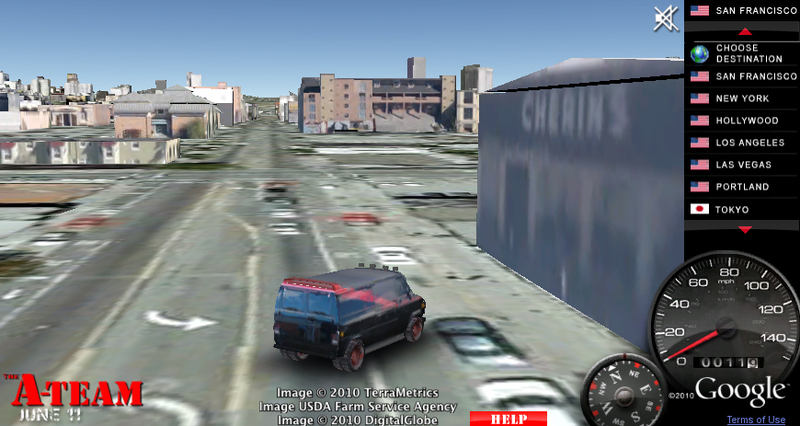 Further down the road the A-Team came across Cherin’s for some old-school Mission flava. Next stop was Good Vibrations on 17th and Valencia where Faceman picked up a Hitachi Magic Wand. Wanting to see something more impressive, the A-Team cruised by Mission Dolores and was wowed by its architecture. Murdock pulled some amazing stunt jumps at Dolores Park but tragically crushed scores of sunbathers beneath the wheels of the A-Team van. At the end of their long journey, the A-Team pulled up in front of the Mission Loc@l offices on 17th street. “I read Mission Loc@l at least twice a day, fool!” remarked BA. There you have it: The A-Team’s Mission District adventure. Driving around the Mission it was clear to see that areas of the neighborhood utilized and populated by working class Latino families received little or no 3D rendered buildings. Conversely, Valencia Street had more rendered buildings than the rest of the Mission District combined. 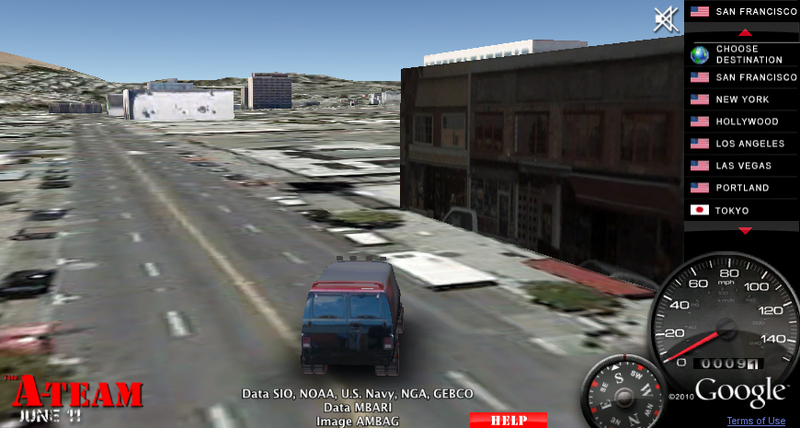 I highly recommend you take your own tour of the city using the game and draw your own conclusions. 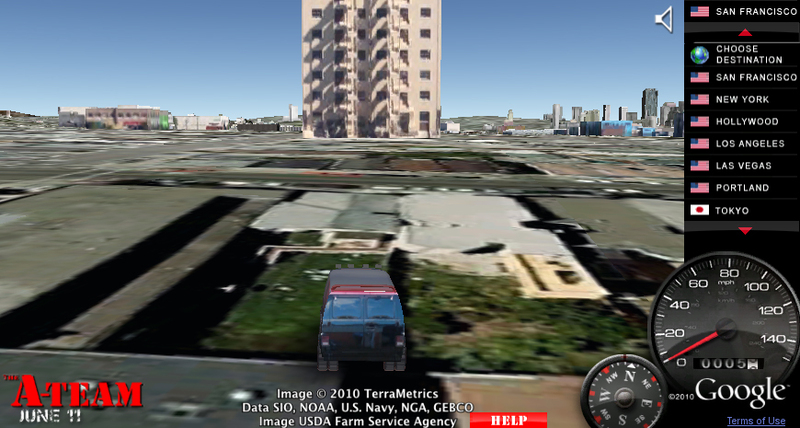 You can do so by visiting http://www.youtube.com/drivetheateamvan (if you don’t have it already, the game will prompt you to download the Google Earth plug-in).